What do SPST, SPDT, DPDT, etc. all mean? Before diving into this tutorial, make sure you’re up to snuff on the most basic of electronics knowledge. If you’re not familiar with the following concepts, consider reading their tutorials first. Then come back, and we’ll have some fun button talk. In the on state, a switch acts just like a piece of perfectly-conducting wire. A short. This closes the circuit, turning the system "on" and allowing current to flow unimpeded through the rest of the system. There are tons and tons of switches out there: toggle, rotary, DIP, push-button, rocker, membrane, ... the list just goes on and on. Each of those switch types has a set of unique characteristics to differentiate it from others. Characteristics like what action flips the switch, or how many circuits the switch can control. Next up, we'll go over some of the more basic switch characteristics. Some examples of switch types. Push button, rocker, slide, and magnetic. Switch actuation can come from pushing, sliding, rocking, rotating, throwing, pulling, key-turning, heating, magnetizing, kicking, snapping, licking,...any physical interaction which can cause the mechanical linkages inside the switch to come into, or go out of, contact. Maintained switches -- like the light switches on your wall -- stay in one state until actuated into a new one, and then remain in that state until acted upon once again. These switches might also be called toggle or ON/OFF switches. Momentary switches only remain active as long as they’re actuated. If they're not being actuated, they remain in their “off” state. You’ve probably got a momentary switch (or 50) right in front of you...keys on a keyboard! Semantic alert! Most of the switches we refer to as "buttons" fall in the momentary category. Activating a button usually means pressing down on it in some manner, which just feels like a momentary control. There are such things as a maintained button, but for this tutorial when we slip and talk about "buttons", think “momentary push-down switch”. As with most components, the termination style of a switch always comes down to either surface mount (SMD) or through-hole (PTH). Through-hole switches are usually larger in size. 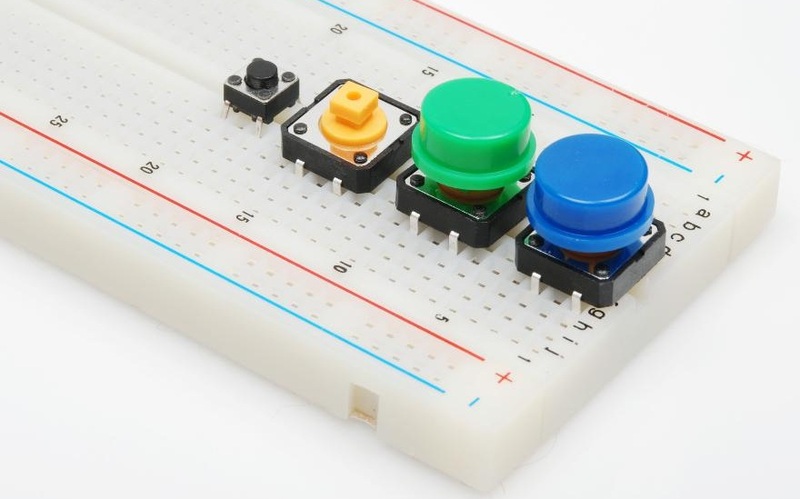 Some might be designed to fit in a breadboard for easy prototyping. 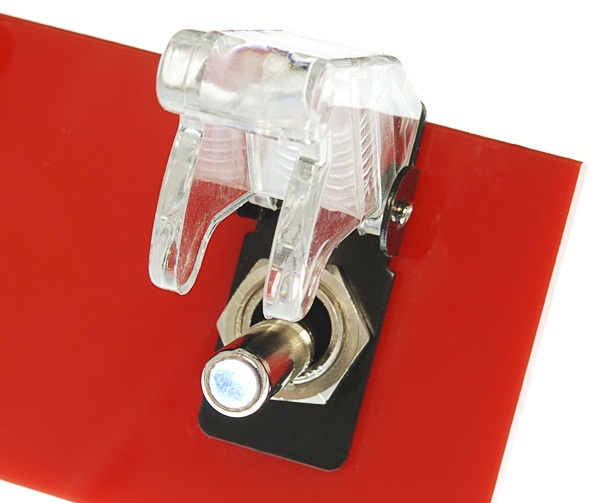 Panel mount switches -- designed to sit outside an enclosure -- are a popular mounting style as well. It’s hard to flip a switch when it’s hidden inside an enclosure. 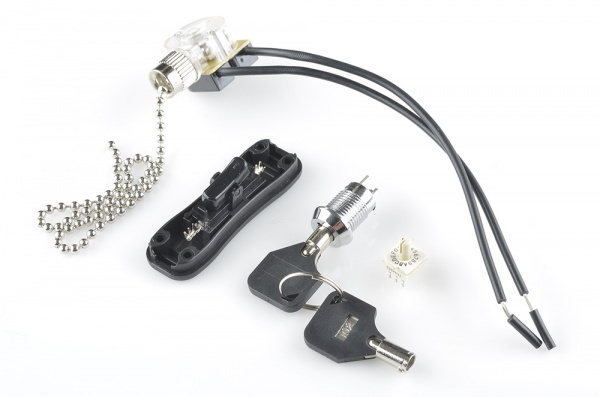 Panel mount switches come in all sorts of termination styles: PTH, SMD, or heavy-duty solder lugs for soldering to wires. One more important switch characteristic, which really deserves a page of its own, is the internal circuit arrangement of a switch. Are you looking for an SPST? DPST? 4PDT? What-P-what-now? An assortment of tactile push-button switches. 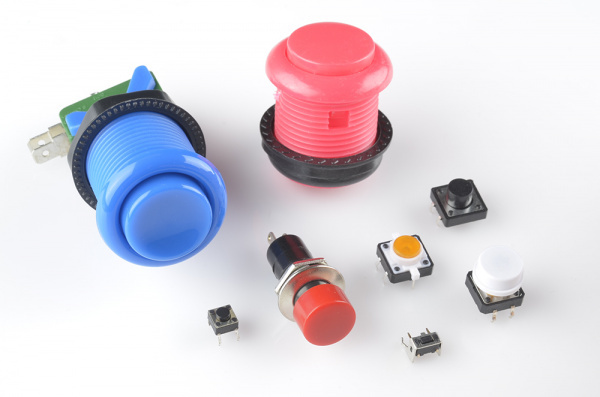 Starting top-left, clockwise: blue and pink arcade buttons, 12mm push button, white capped button, orange illuminated, right-angle, panel-mount, and a mini push button. 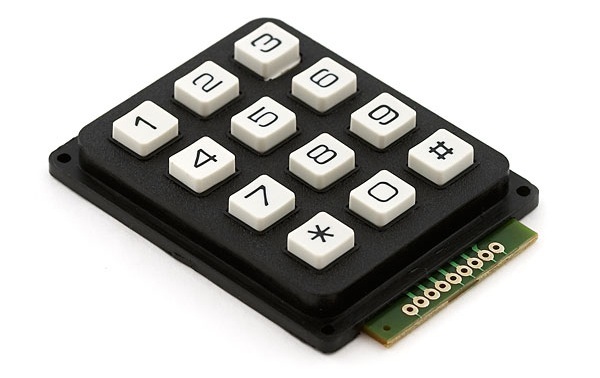 Large arrays of momentary buttons, like your keyboard or even smaller groupings like a keypad, usually arrange all of their switches into a big matrix. Every button on the pad is assigned a row and column . This requires some extra button-press-processing on the microcontroller end, but frees up a big chunk of I/O pins. A maintained switch retains its state until it’s actuated into a new one. Just look to the nearest wall for an example of a maintained switch -- the thing controlling your lights! Maintained switches are great for set-it-and-leave it applications like turning power on and off. When you hear toggle switch, think “fire ze missiles!”. 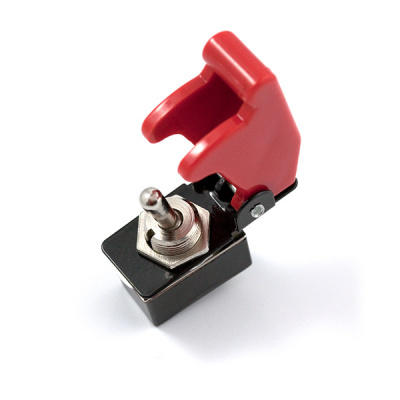 Toggle switches have a long lever, which moves in a rocking motion. As they move to a new position, toggle switches make a really satisfying “snap”. 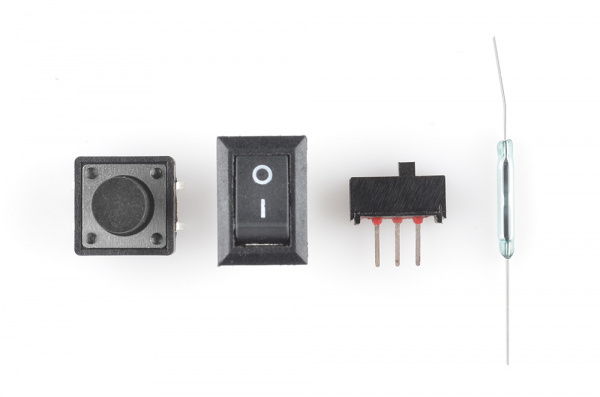 Toggle switches are commonly SPST (two terminals) or SPDT (three terminals), though you can find them in other flavors as well. As usual, you can find them in through-hole, surface-mount, or -- probably most commonly -- as panel-mountable. Push-buttons aren't all momentary. Some push-buttons will latch into place, maintaining their state until pressed again latching back to where the started. 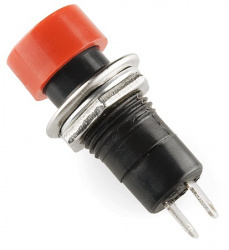 These can be found, for example, in stomp switches on guitar effect pedals. We've barely started to cover the huge variety of maintained switches out there. There’s pull-chain switches, which add a really classy touch to your project. Key-switches, for when you don’t want just anybody turning on your killer robot. 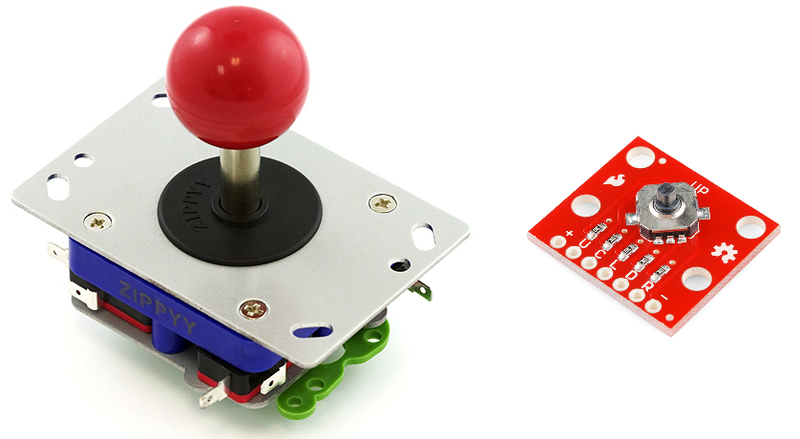 Rotary switches -- like those on a multimeter -- provide a unique input device, especially when you’ve need a high number of throws. And, of course, what mad scientist could live without a big ol’ knife-switch? Among the most obvious of switch applications is simple on and off control. The type of control you perform every time you walk into a dark room. An on/off switch can be implemented by simply sticking an SPST switch in series with a power-line. Usually the on/off switch will be maintained, like a toggle or slide switch, but momentary on/off switches can have their purpose. When implementing such a switch, keep in mind that all the current your project consumes is going to run through that switch. Ideally a switch is a perfect conductor, but realistically it's got a small amount of resistance between the two contacts. 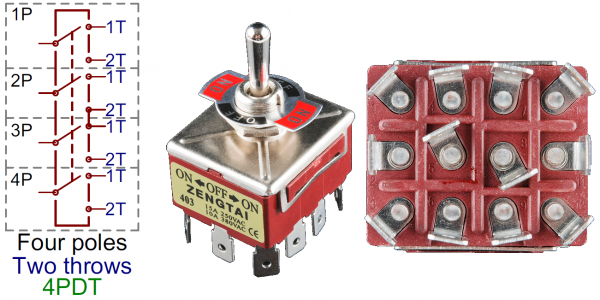 Because of that resistance, all switches are rated for a maximum amount of current they can withstand. Exceed a switch's maximum current rating, and you can expect melted plastic and magic smoke. 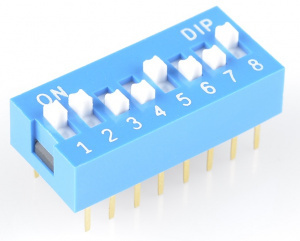 For example, this SPDT slide switch is great for controlling current flow in small projects (like Simons or Metronomes), but don't try using it to control beefy motor controllers, or strings of 100 LEDs. For that, consider using something like a 4A toggle switch or a 6A lamp switch. 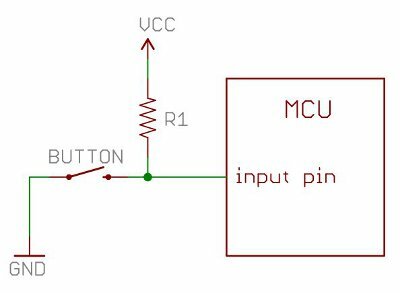 When the switch is open, the MCU pin is connected through the resistor to 5V. When the switch is closed, the pin is tied directly to GND. The resistor in that circuit is a pull-up resistor, required to bias the input high, and prevent a short to ground when the switch is closed. Pull-up Resistors - Pull-up resistors complement most momentary button circuits. They ensure that power and ground don’t short, and they make sure I/O lines don’t float. Transistors - These can be used (among many other things) as sort-of electronically controlled switches. Relays - Another electronically controlled switch. Great for turning on and off high-power circuits. Accelerometer Basics - Motion-sensing accelerometers -- like those in most smartphones and new video game controllers -- are fast-replacing these boring switches as human input devices. How to Power a Project - What kind of power source will your switch be turning on and off? MP3 Player Shield Music Box - This project (bigger on the inside) uses one of those non-traditional switches -- a reed switch -- to trigger it’s action. The Uncertain 7-Cube - Well, this project doesn’t actually have any switches, but that’s what makes it so special! This project is a great example of how an accelerometer could replace a switch as an input device. Or check out this blog post for more ideas.